Richey James, lyricist and guitarist with Manic Street Preachers, has gone missing and his car has been found, empty, near the Severn Bridge. Caroline Sullivan and Alex Bellos chart the rise of this charismatic but troubled musician. It's not unheard of for a rock musician to disappear. In the late sixties Fleetwood Mac's Jeremy Spencer went missing from a Los Angeles hotel a few hours before a concert. When he was found some days later - with the Children of God religious cult - he refused to return to the band and never played with them again. Joe Strummer walked out on the Clash in the early eighties, not to be seen again until he was tracked down in Paris by a private detective. Strummer said he had simply wanted a break. On February 1, Richey James, guitarist with the Manic Street Preachers, left the Embassy Hotel in London shortly before he was due to fly to the US for interviews publicising a 30-date tour. He has not been seen since. Scotland Yard believe he drove his silver Vauxhall Cavalier to his Cardiff Bay flat. Last Friday the car was found at Aust service station on the M4, a few hundred yards from the Severn Bridge, which is a notorious suicide spot. The car had been there since the Tuesday, February 14. Police, his family and the three other band members are seriously concerned, as Richey's infamous mood-swings have previously brought him close to the edge - last year he was admitted to a private clinic for alcoholism, anorexia and self-mutilation. The Manics are a famously flamboyant group, and Richey is its most flamboyant member. Although not yet a household name, their bleak punk rock has struck a chord with an unusually large cross-section of young music fans, stretching from heavy metal to teen pop. In the last three years they have had a string of top 40 singles, and have released three albums, the first two selling more than 100,000 in the UK: they were poised to become a world commodity. As well as the US tour, negotiations had begun for them to write the theme tune to the Judge Dredd film, starring Sylvester Stallone. At such a crucial point in his career, why did Richey run away? Despite a fine musical tradition, Wales has not had its fair share of success in the pop world. Apart from a brief hiccup with the Alarm in the 1980's, Welsh rock starts and ends with Tom Jones and Shakin' Stevens. The Manics all come from the close-knit, working-class community of Blackwood, in the heart of the valleys. As the mines closed down, Blackwood and its one road of shops has reinvented itself as a small commercial centre. In the evenings, gangs of teenagers hang out in shop doorways; there is little else to do. This is the background in which the band - Richey (real name Richard James Edwards), Nicky Jones, Sean Moore and James Dean Bradfield - grew up. Sean and James are cousins and shared the same bedroom as children. Richey lived with his grandmother because his parents, both hairstylists, could not afford to look after him. The boys met at Pontllanfraith Junior School and continued their education together at Oakdale Comprehensive, then at Crosskeys Tertiary College. Among schoolfriends, the Manics are remembered fondly, especially for their intelligence, always with their noses in books. They recall Richey as being shy. All of the Manics have A-levels - Richey has often flaunted his three A grades - and he and Nicky went to Swansea university; Richey got a degree in history in 1989, making him unusually academic for a rock star. In 1988, James, Sean and Nicky started to play in a band together. Richey joined in 1990 as guitarist, even though he "could only play two chords". But his input was perhaps the most important and it was only once he joined that the band focused its direction. His real contribution is in the lyrics, expounding his nihilistic world view. "What with unemployment and the rain, there is a feeling that there is no hope in Blackwood. A lot of younger people feel that. The Manics said life is short - but you can break out of it," says Patrick Jones, Nicky's elder brother who works in Blackwood library. "I don't think the Manics set out to break any taboos. They were idealistic and wanted to change things." Richey, who has Useless Generation tattooed on his left arm, later said: "Where we come from, there is a natural melancholy in the air. Everybody, ever since you could comprehend it, felt pretty much defeated." The band's spleen was first vented towards the Manchester music scene, which was dominant at the time. Cleverly marketing themselves to appeal to fans of both rappers and rockers, they blended a cross-dressing stage image with situationist slogans - done before perhaps, but certainly not in Wales. In the postmodern style of the day, the Manic Street Preachers was a concept well before it became reality. In 1990 they swept into view in a feature in Melody Maker, with their truculent opinions splashed across a centre spread. According to Richey and company, the band was created simultaneously to celebrate and trash the emptiness of modern life. The Manics were to be the biggest band ever; they would sell 30 million copies of their first album, then, at the height of their success, split up. After two singles on the Heavenly label, they were signed by Columbia in 1991 and had their first top 40 hit, Love's Sweet Exile, in November. The debut album, Generation Terrorists - full of quotes from Sylvia Plath, Camus, Rimbaud and e e cummings - climbed to number 13 the following February. A cover version of the theme from M*A*S*H (Suicide Is Painless) reached number seven in September 1992, their highest chart position. The second album, Gold Against The Soul, reached number eight in the summer of 1993. By now, Richey was a cult figure. He was dynamic and charismatic on stage, and loved by the music press for providing great copy (who else would spout mock profundities such as "Love is an impossible concept" at the drop of a hat?). Once he cut the phrase "4 REAL" into his arm during an interview with NME journalist Steve Lamacq, who suggested the Manics were just a Welsh rehash of the Clash. 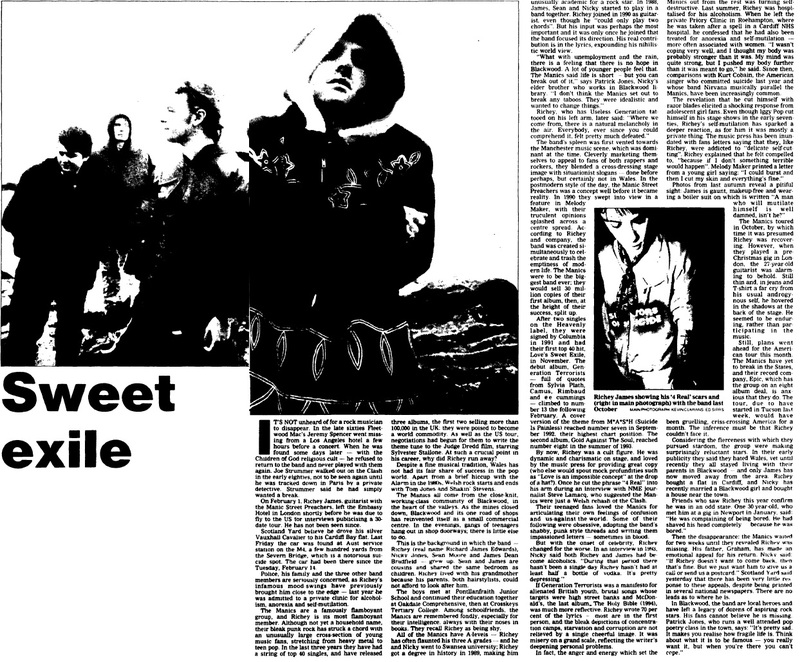 Their teenaged fans loved the Manics for articulating their own feelings of confusion and us-against-the-world. Some of their following were obsessive, adopting the band's shabby, punk-style threads and writing them impassionate letters - sometimes in blood. But with the onset of celebrity, Richey changed for the worse. In an interview in 1993, Nicky said both Richey and James had become alcoholics. "During that period there hasn't been a single day Richey hasn't had at least half a bottle of vodka. It's pretty depressing." If Generation Terrorists was a manifesto for alienated British youth, brutal songs whose targets were high street banks and McDonald's, the last album, The Holy Bible (1994), was much more reflective. Richey wrote 70 per cent of the lyrics - most are in the first person, and the bleak depictions of concentration camps, starvation and corruption are not relieved by a single cheerful image. It was misery on a grand scale, reflecting the writer's deepening personal problems. In fact, the anger and energy which set the Manics out from the rest was turning self-destructive. Last summer, Richey was hospitalised for his alcoholism. When he left the private Priory Clinic in Roehampton, where he was taken after a spell in a Cardiff NHS hospital, he confessed that he had also been treated for anorexia and self-mutilation - more often associated with women. "I wasn't coping very well, and I thought my body was probably stronger than it was. My mind was quite strong, but I pushed my body further than it was meant to go," he said. Since then, comparisons with Kurt Cobain, the American singer who committed suicide last year and whose band Nirvana musically parallel the Manics, have been increasingly common. The revelation that he cut himself with razor blades elicited a shocking response from adolescent girl fans. Even though Iggy Pop cut himself in his stage shows in the early seventies, Richey's self-mutilation has sparked a deeper reaction, as for him it was mostly a private thing. The music press has been inundated with fans letters saying that they, like Richey, were addicted to "delicate self-cutting". Richey explained that he felt compelled to, "because it I don't something terrible would happen". Melody Maker printed a letter from a young girl saying: "I could burst and then I cut my skin and everything's fine." Photos from last autumn reveal a pitiful sight: James is gaunt, makeup-free and wearing a boiler suit on which is written "A man who will mutilate himself is well damned, isn't he?" The Manics toured in October, by which time it was presumed Richey was recovering. However, when they played a pre-Christmas gig in London, the 27-year-old guitarist was alarming to behold. Still thin and, in jeans and T-shirt a far cry from his usual androgynous self, he hovered in the shadows at the back of the stage. He seemed to be enduring, rather than participating in the music. Still, plans went ahead for the American tour this month. The Manics have yet to break in the States, and their record company, Epic, which has the group on an eight album deal, is anxious that they do. The tour, due to have started in Tucson last week, would have been grueling, criss-crossing America for a month. The inference must be that Richey couldn't face it. Considering the fierceness with which they pursued stardom, the group were making surprisigly reluctant stars. In their early publicity they said they hated Wales, yet until recently they all stayed living with their parents in Blackwood - and only James has now moved away from the area. Richey bought a flat in Cardiff, and Nicky has recently married a Blackwood girl and bought a house near the town. Friends who saw Richey this year confirm he was in an odd state. One 30-year-old, who met him at a gig in Newport in January, said: "He was complaining of being bored. He had shaved his head completely - because he was bored." Then the disappearance: the Manics waited for two weeks until they revealed Richey was missing. His father, Graham, has made an emotional appeal for his return. Nicky said: "If Richey doesn't want to come back, then that's fine. But we just want him to give us a call or send us a postcard." Scotland Yard said yesterday that there has been very little response to these appeals, despite being printed in several national newspapers. There are no leads as to where he is. In Blackwood, the band are local heroes and have left a legacy of dozens of aspiring rock stars. His fans cannot believe he is missing. Patrick Jones, who runs a well-attended pop poetry class in the town, says: "It's pretty sad. It makes you realise how fragile life is. Think about what it is to be famous - you really want it, but when you're there you can't cope." This page was last modified on 15 May 2018, at 09:18.